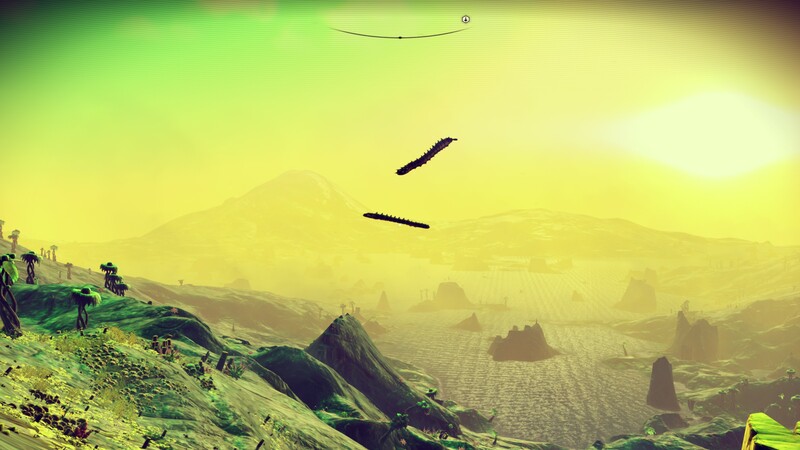 At its heart, No Man’s Sky is an exploration and resource-gathering/crafting game. The exploration part is meant to be the primary draw of the game, with quintillions of procedurally generated planets featuring endless varieties of procedurally generated flora, fauna and terrain. Once you discover a system, planet, location, animal, plant or mineral formation, you are offered the chance to name your discovery and upload it for any other person who happens upon your discovery to… discover. Which may never happen, given the apparently large number of star systems and planets. So you may never find my creepy spider crab monsters that I have named Run Away. 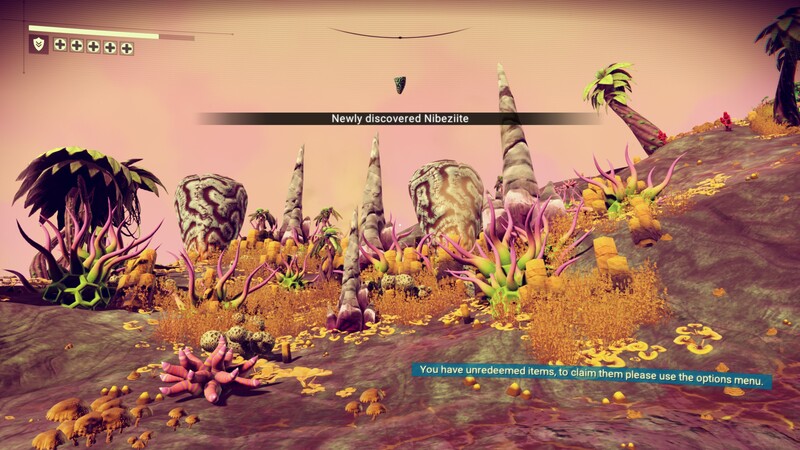 Now the potential issue with the procedurally generated planets, flora and fauna in this game is that you may have the bad luck of finding planets that do not interest you. They may have four-legged bison-like animals that you’ve seen on the previous planet, your first five planets may be a mix of desolate rocky planets and toxic hellholes, or you may just not want to see any planets other than lush and verdant ones. But stick with the game and you will (hopefully) eventually see planets with sweeping grasslands, bipedal stegosaurs and varied waterways. So on this point I would say take a look at some videos of gameplay and decide for yourself whether you find the planets people are finding inspire a sense of wonder in you, and whether you could find yourself continuing to explore new life and to boldly go where no one has gone before. The exploration also extends to alien interaction. The galaxy is, for whatever reason, inhabited entirely by just three sentient races (apart from the player) – the Gek, the Korvax, and the Vy’keen. But you don’t start the game understanding their language, and must find knowledge stones and monoliths on planets to slowly learn words for each of the races’ languages. Which turns alien interactions into a quite fun puzzle, as you must figure out what to do from the few words you can understand of their language. So you need to decide whether to give energy to a Korvax who is saying something about convergence and echoes, or to shake the hand of a Korvax surging with electricity. Again, it is surprisingly fun and hopefully there is enough variety in the encounters to not get too stale. Of course, that is not the only aspect of No Man’s Sky. Apart from exploration the core gameplay loop revolves around the collection of various elements. These elements are used to either fuel your various devices and your ship, create items needed to unlock doors and chests, or to craft upgrades for your ship, your exosuit and your tool/weapon. These elements and items (but not upgrades) can also be traded for currency (units) at trading stations on planets and in space stations. In this respect it is very similar to crafting/survival games like Minecraft and 7 Days to Die, however there is no base building in the game yet, nor can you craft a ship outright. Which brings me to acquiring ships. One of key things in the game is upgrading your inventory space, which is also the space where you place upgrades for your exosuit and ship. The more space you have, the more elements you can carry and the more upgrades you can put into your suit and ship. The number of slots for upgrades for your multitool can also be increased. But the process of increasing these slots/spaces is a little odd. For your exosuit, you need to find exosuit upgrade stations on planets (they are found in landing pods or behind locked doors on space stations) and pay units to get an additional slot. For your multitool, you need to go to inhabited stations on planets and trade your multitool in for a better one, but the offered multitool might not always have more slots. For your ship, you need to either buy a ship off someone who lands at a trading station or space station (yes, the ship they land in), or find crashed ships on planets using transmission towers to locate them. 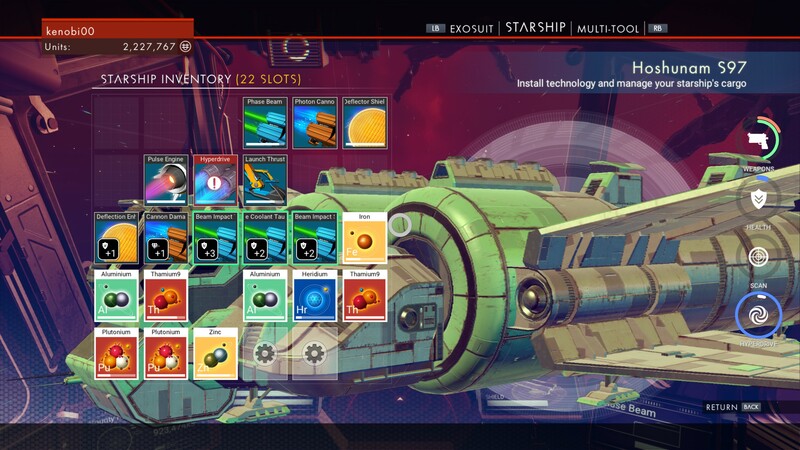 Crashed ships will at most have one more slot than your current ship, while purchased ships can have many more slots but are pricier as the slots increase. So you will need to make units in order to get more inventory space. Which is not particularly hard, but it can encourage grinding behaviour for people who want to upgrade their space as soon as possible. This is due to the fact that you can reach the maximum slots by staying in a single planetary system, as long as you have a planet with a single rare material that you can sell for a high price. Which can be a trap, as the best ways to grind will tend to make you stay in one environment for a fair bit of time, and part of the appeal of the game is to explore new environments and not be too attached to one. Indeed, staying on planets for too long is likely to make you bored. Expanding your inventory space is also the only real ‘gameplay’ part of the game, and if you beeline for the max slots from the start you may find yourself with no attachment to the rest of the game. So on this point I would say that the game suffers from its choice to solely revolve around crafting and upgrading as its gameplay mechanic, and not spreading out the required materials across several planets in different galaxies. Finally there is the space flight and the combat part of the game. Which is honestly quite shallow. Space flight is very casual – the game is quite forgiving with collisions with the shielding of your ship, flying at impulse is quite short, and on planets your flight controls are limited to prevent you from crashing into the planet. As for combat, on foot you use your multitool’s boltcaster mode to shoot at robots, which is not that much of a challenge; and in space you’ll only be fighting against pirates or as a pirate against frigates. Space combat is a similarly simple affair, you either use the hitscan mining laser or lead your shots with the cannon to kill your enemies. Challenge comes from numbers of enemies rather than specific enemy types, and you’ll want to upgrade your shields and weapons to address that challenge. I would say this part of the game is nothing to hang your hat on, but it’s nice that it’s there and it’s nice to see that your upgrades do make a difference. I think it’s fair to say that there were three major space games in the recent zeitgeist: No Man’s Sky, Elite: Dangerous and Star Citizen (I’m excluding Eve Online because it’s quite old at this point). There have been a number of comparisons between NMS and Elite in discussions of this game, so I’ll quickly discuss that. Frankly, I think these are two quite different games. In NMS trading is barebones, combat is barebones, space flight is very short between A and B and there are no factional politics or wars to speak of. Elite is a much more serious affair, though by contrast the planets in Elite are much, much less interesting. I do agree with the sentiment that a combination of NMS and Elite would make for a great dream game, but as they stand I think they have established themselves as two different sorts of games. As I’ve said, for me No Man’s Sky is a great podcast/Youtube game – I can have listen to a podcast or have a video playing in the background while playing the game. The casual flight controls, the moments of downtime between planets and sights, and the very undemanding gameplay mechanics make for the perfect relaxation game. 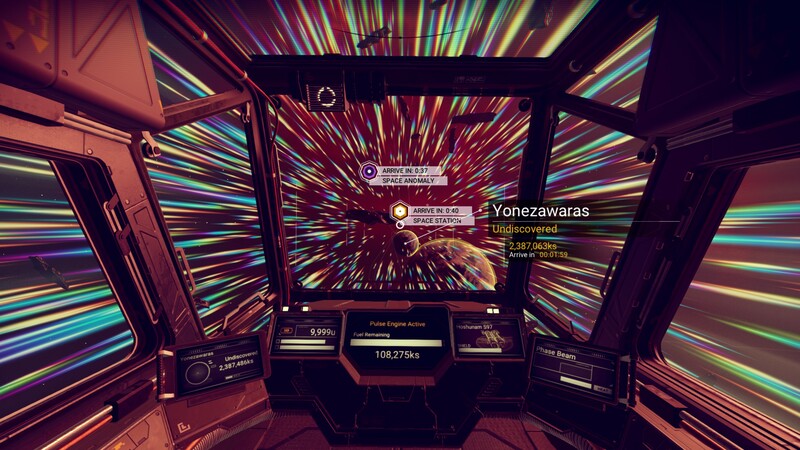 The scope and magnitude of the galaxy Hello Games has created is amazing and interesting, but there is a nagging feeling that they should’ve done more before releasing. Perhaps tweaking the rarity of the extreme procedurally generated stuff (like giant sand worms) so they come up a bit more often, including base building with the release, and having upgrades tied more to exploration. 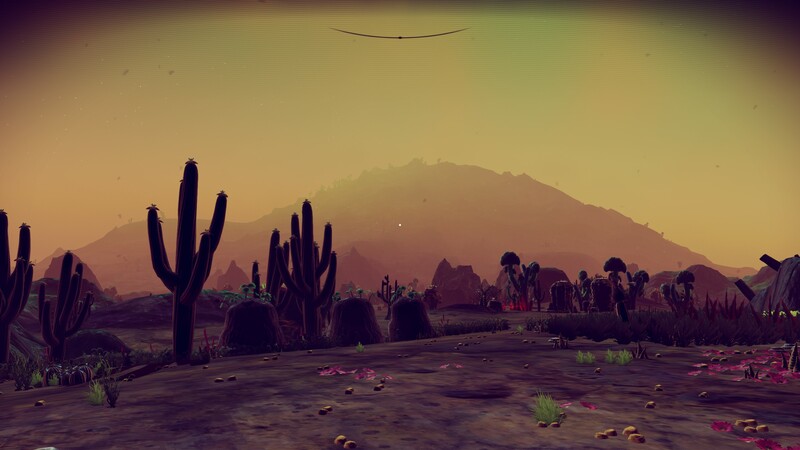 The good news is that Hello Games appear to be dedicating themselves to updating the game with new features, ala Minecraft, so we should hopefully see a better game in six months to a year. So to answer the question of whether you should get this game as it stands now, for the AU$60+ it’s on sale now for, I would say take a look at the planets people are finding and whether that alone is enough to keep you interested. Otherwise I would wait until more updates come and the game lowers in price.